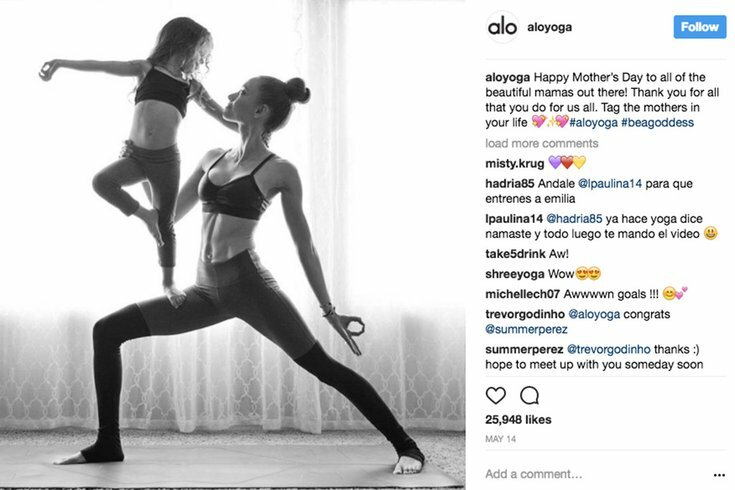 Alo Yoga's 2017 Mother’s Day tribute featured a woman whose waist is the size of her young toddler's, Dana Falsetti says. Such marketing by the big Yoga brands counters healthy, realistic yoga inspiration, she argues. Every few years, the media erupts with stories about the commercialization of western yoga and the body shaming, racial discrimination, and cultural appropriation that ensue. The conversation is ignited (the fire is usually held to lululemon, whose controversial, sizeist former CEO built his business model by marginalizing fuller figured women ), and then the discussion slowly dies down. 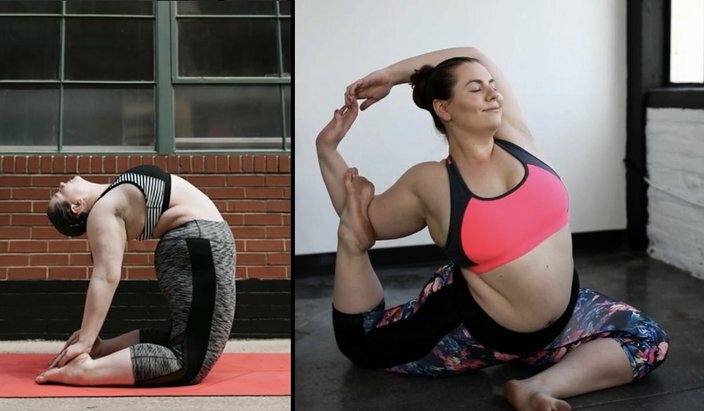 People reabsorb the idea that yoga is the exclusive privilege of thin, white women, whose spines naturally bend in half. Bucks County native and international yoga teacher, Dana Falsetti, is no stranger to the debate over the accessibility of yoga and whether or not newbies must fit into a pair of expensive size-zero yoga pants before venturing into their first class. Falsetti gained widespread attention last year for her stunning asanas that shattered stereotypes about the “ideal” yoga body and inspired people of all shapes and sizes to take up their own yoga practice. She now has nearly 300,000 loyal followers on Instagram, where she shares yoga inspiration and body positivity daily. But the Internet yoga star knows how difficult it is for healthy, realistic yoga inspiration to offset omnipresent marketing by corporate yoga giants like Alo Yoga , whose Instagram page showcases only lean, mostly fair-skinned women engaged in contortionist, acroyoga poses that would be downright dangerous for anyone but the most advanced practitioners to attempt. Even new mothers aren’t allowed an ounce of extra body fat on Alo Yoga’s Instagram. The company’s 2017 Mother’s Day tribute features a woman whose waist is the size of her young toddler’s. 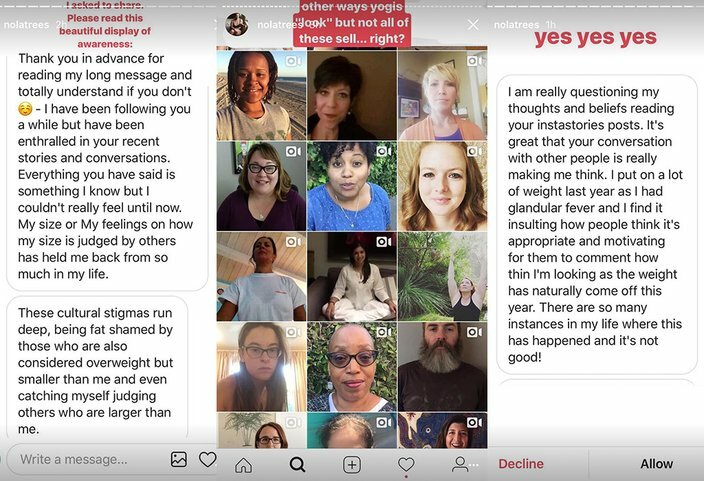 During the recent holiday weekend, Dana Falsetti took to Instagram to vent her heartfelt frustrations with the marketing of corporate yoga giants. She received hundreds of messages from people of all walks of life, who said they felt their self esteem had been diminished from an early age because of fashion brands like Alo. Over the extended Fourth of July weekend, Falsetti decided she’d had enough of this kind of advertising and took to Instagram, where she vented her heartfelt frustrations via the platform’s “Story” feature. Within minutes, she began receiving hundreds of messages from people of all walks of life, who felt their self esteem had been diminished from an early age because of fashion brands like Alo. As western elitism continues to corrupt yoga, a spiritual practice Falsetti exalts as “a path on the way home to yourself,” she’s rallying consumers to take a stand and never back down. On the eve of Independence Day, she recorded dozens of Instagram video clips, sharing her pain and encouraging virtual strangers to share theirs. “Do you guys know that I get emails every day, every day, for the last three years from people who have felt so much shame that they literally feel like they did not live? They never put the bikini on, they never went to the yoga class. They never put themselves out there because of what society and these companies and corporations perpetuate. Falsetti told PhillyVoice the comments and messages continue to overflow. For all the solidarity, Falsetti attracted some backlash, too. She described a few people who felt personally attacked by her critique of the corporate ideal. She received several angry messages insisting “all bodies matter,” a fact Falsetti does not dispute. Falsetti says that for all the body hatred she experienced throughout her life because of her weight, she hasn’t received nearly the level of discrimination faced by others in the yoga community. “I’m only one step away from the ideal by fatness, but I’m still white, able-bodied, young, and affluent. But as you start moving farther away from that, people are represented less and less,” she said. Falsetti wants people to know that yoga “saved” her and many others but, even though she’s capable of difficult postures after years of practice, neither handstands nor backbends ultimately brought her peace. For this reason, most yoga studios don’t even have mirrors. There’s little to no opportunity to look outwardly at yourself in a yoga class. The point is to look inward. And the physical practice of yoga can be so challenging and all-consuming, there is a very good chance you won’t notice anyone else in the room either. You should walk out of a good yoga class like a blank slate. You shouldn’t remember anything superficial about your fellow yogis – their clothes or body type – except maybe the sound of their breath. 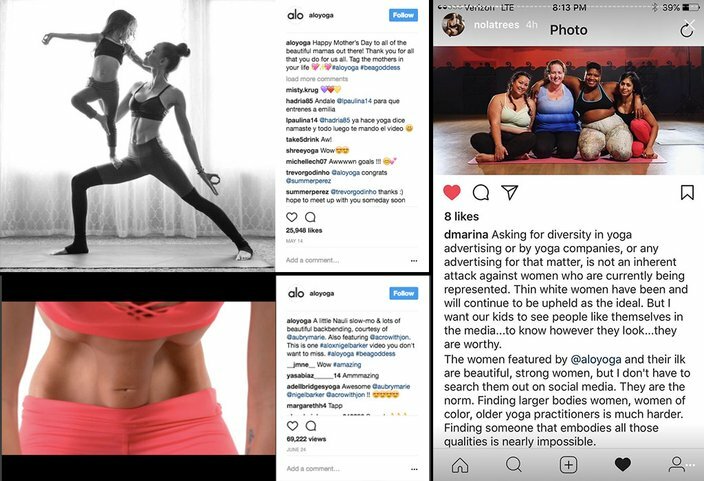 Alo Yoga's Instagram page showcases only lean, mostly fair-skinned women, says Dana Falsetti. The common misconception is that yoga must look beautiful and is a luxury for people who already have “perfect” bodies and “perfect” lives. But yoga isn’t supposed to be an elite exhibition; it’s an often grueling practice, a healing modality for bodies that are tired, injured, or sick. Falsetti describes the yogis she knows as “some of the most interesting and affected people” she’s ever met. Falsetti says now that she’s achieved Instagram popularity, she’s using the platform for what she believes is its true value: driving social change. In the coming weeks, she is launching a body positive podcast on her website, to continue the dialogue about shame and marginalization in the yoga community and beyond. Her goal is to provide a platform for diverse and even controversial voices and opinions.